What do you associate most with the Westminster Kennel Club Dog Show? Chances are it’s the Select Seven final and the dog that walks away with the title of America’s Dog for the next year. It’s the ultimate climax to two days of intense competition that takes the dog and handler through a corridor of breed, group and ultimately Best In Show judging. It’s the ultimate showcase for dogdom – New York City, media capital of the world, and nationwide live television exposure. And, of course, to the winner goes the whirlwind media tour the following day in New York City, with stops at major morning talk shows and photo ops at Sardi’s Restaurant and the observation deck of the Empire State Building. But it’s the earthy back-stage, outside-the-ring stories that resonate with many dog owners, too. George, an over 13-inch beagle owned by Michelle Okashima, Kelly Hackler and Tracy Olson, of Kings Beach, Calif. Shortly after Christmas, Okashima was working late in her store, taking down holiday decorations. “I was in the back of the store when I heard George alarming ferociously, in true beagle fashion. I came out of the back room to find George’s nose up against the glass door facing down a would-be intruder trying to get the door ajar,” she recalls. His alarm allowed Okashima to get a good look at the culprit. A 911 call was made and the man was arrested shortly thereafter. He was thought to have ties with a string of burglaries of local businesses. “Solid and big for his inches. Indeed. Not to mention, my hero,” says Okashima. George became a registered therapy dog (Therapy Dogs International) in 2011 and a service dog in late 2013. He also owns CD and Rally Novice titles. In addition, George is a hiking and snowshoe partner for Okashima. Ticket, a border terrier owned by D’Arcy Downs-Vollbracht, of Golden Valley, Ariz. Ticket is a therapy-dog hero, visiting hospitals with cancer patients, hospice wards, a children’s hospital and has been adopted by a school for special-needs children. She is also a courthouse victim-witness dog, where she is a steadying influence on children and victims of violent crime. She also does a yearly domestic-violence education program in junior high schools and has her own Facebook page where children can keep in touch with her. “Becoming a champion and participating in Westminster is just icing on the cake for her and a dream come true for me,” says Downs-Vollbracht. In one case, Ticket spent up to 12 hours a day with a young patient suffering from Elhers Danlos syndrome, making a huge difference in her attitude and recovery. The syndrome is a group of inherited disorders that affect the patient’s connective tissues – primarily the skin, joints and blood-vessel walls. The tissue is a complex mixture of proteins and other substances that provide strength and elasticity to the underlying structures in the body. Ticket’s prowess also extends to the other end of behavioral line. At a residential treatment facility, a young victim of abuse and neglect, was suffering from numerous behavioral and psychiatric problems, including cutting herself. Logan, an American Staffordshire terrier owned by Christy Wrede, of Eatontown, N.J.
Wrede adopted Logan from the Monmouth County (N.J.) SPCA when he was 1½ years old. He had already been deemed a “dangerous dog” and returned to the shelter four times. In other words: the ultimate underdog candidate for adoption. Because Logan mirrored the appearance of a pit bull some staffers were initially scared of him but it wasn’t long before they felt at ease in his presence. His resume also includes reading programs with children at area libraries. “He has taught me how to take risks, persevere, love unconditionally, laugh and most of all enjoy life to its fullest,” says Wrede. Sassy, a St. Bernard owned by Susie Collier, of Penfield, N.Y.
For Collier, two St. Bernards, Patton and Sassy Girl, have given her a reason to live and push forward after suffering a stroke in November 2012. It was Patton at first, who refused to leave her side after her hand went numb. Thinking it was a pinched nerve, she took Advil and the numbness disappeared. The next day it recurred. A friend drove her to the hospital and by the time she arrived the entire left side of her body was paralyzed. “What Patton tried to tell me for two days, the doctor diagnosed – I suffered a stroke,” recalls Collier. While attempts beforehand failed, these worked, leaving health professionals baffled but pleased. She continued her recovery at home with plenty of assistance from a friend and her Saints, with an “unyielding determination” to return to conformation showing with Sassy. Throughout 2013, her physical therapists taught Collier to walk, strengthen her muscles and use her left arm again. “They even offered to watch me work with Sassy at PT,” she adds. To the cheers of dozens of friends, she and Sassy returned to the ring at the St. Bernard Club of America National last year in Nebraska, where they won Adult Amateur Showmanship. And last month their journey back included a special stop at Westminster. Haley, 15, and Gable came to the Big Apple and experienced Westminster for the first time last month. While the sleek, smooth-gaiting golden grabs his share of attention, 15-year-old Haley is the story here. She and her brother, Taylor, were adopted by Shari and Kevin Curran at the age of 26 months from Russia. The children, according to Shari Curran, had been found starving and abandoned by their mother, an alcoholic. At 26 months, Haley weighed only 16 pounds and was suffering from malnutrition, which triggered scoliosis. After arriving in the United States, Haley was diagnosed with Ricket’s, a vitamin D deficiency that becomes apparent during infancy or childhood and is rarely seen in this country. The child was unable to walk or talk and, according to Shari Curran, had never been around animals, seldom seen sunlight or experienced love and attention. Within six months and proper nutrition, Haley and her brother were fast on the road to recovery. Jimmy was adopted from the Richardson (Texas) Humane Society at 10 weeks of age after being pulled from a “kill shelter” near Dallas at 7-8 weeks old. 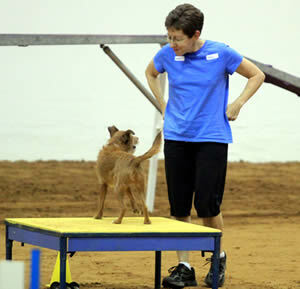 The long-legged, scruffy red-haired terrier mix has since become one of the premier agility performers in the country. 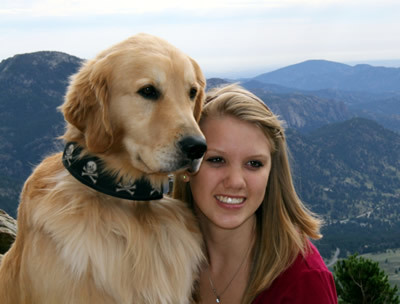 The 17-pounder recently earned a MACH 4 and is a registered therapy dog with Heart of Texas Therapy Dogs. “I can’t quite describe the feeling I have when I run Jimmy, like we’re connected by a very thin elastic band that stretches and adapts to wherever we are in relation to one another,” explains McLean. “If we’re lucky, the band holds. If it breaks it probably means I made a mistake or got out of position. And I feel with each run that we learn something that we didn’t know before, even after almost eight years of competition. A couple of years ago, McLean’s professional and personal lives intersected when she participated on a panel on dogs and film at a film conference. The result: She has produced an anthology, “Cinematic Canines: Dogs and Their Work in The Fiction Film,” that is being published by Rutgers University Press this month.